UPDATE: New Eversave shoppers now get a $5 signup credit instead of $1, making this deal only $18 shipped for newbies! 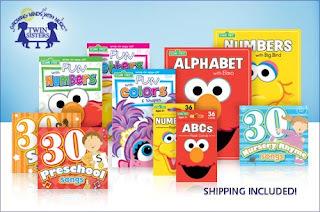 Today at Eversave, you can get a 10-piece set of Sesame Street flashcards, wipe-clean books and CDs for only $23 shipped...this regularly costs $46.90! The set will automatically ship to the address provided at checkout. If you're a new Eversave shopper, you'll get the deal for $22 using your $1 signup credit. Also, anyone who purchases and shares the deal will get $2 in credit to use on a future purchase.